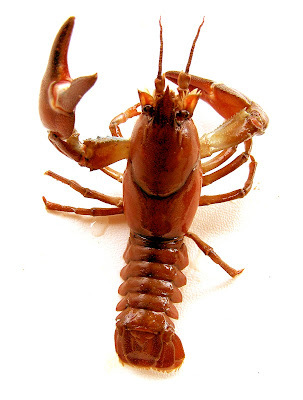 Crayfish, or Crawfish is a freshwater crustacean that is related to the lobster. They are similar to the lobster in body structure and share the same physical features. The difference between the two is that the crayfish is smaller in size than the lobster and that they live in freshwater rather than in the ocean as the lobster does. The crayfish is about six inches long and come in different colors such as white, red, brown, orange, dark green, or black. The crayfish has two pairs of antennae, a rigid shell, pincerlike claws, and four pairs of legs. They breathe through feather-like gills are found in brooks and streams where there is fresh water running. Crayfish feed on living and dead animals and plants. One of the most invasive species on the planet is able to source food from the land as well as its usual food sources in the water, research from Queen Mary, University of London has found. Scientists analysed the behaviour of red swamp crayfish in Kenya's Lake Naivasha and found that when the water level of the lake was low, the crayfish found additional food sources on land. The study was published in the journal PLoS ONE today (3 August 2012). Lead author Dr Jonathan Grey from Queen Mary, University of London explained: "These crayfish are incredible survivors; our research shows they are able to feed off terrestrial plants directly, as well as aquatic plants – the first study to demonstrate this. "It has significant implications for anyone looking to introduce these species in other areas." The research team looked at the diet of the crayfish through a technique called stable isotope analysis, where they used a natural chemical signal of diet in the species' tissues to determine what they were eating. They found a proportion of the crayfish population had left the main lake and were surviving by burrowing in hippopotamus footprints which left small pools of water. After dark the crayfish clambered out from the footprints and grazed on the surrounding terrestrial plants. "This study demonstrates how the red swamp crayfish is such an extraordinarily successful invader," Dr Grey said. The red swamp crayfish has been introduced to multiple locations throughout East Africa from the 1960s to enhance fisheries and to attempt to control populations of snails which carry a parasite causing river blindness in humans. "While they are useful to counteract other harmful species in ecosystems, they are also extremely damaging to fish populations and the balance of the food web. They eat plants, fish eggs, fly larvae, snails and leeches and since we have now shown that they are able to tap into extra resources from the land, they can sustain higher populations under adverse conditions such as low water and could cause more of a problem in a variety of environments than we initially thought."